AquaBounty, a U.S. biotechnology company based in Maryland, has secured approval from the Canadian government to export 100,000 AquAdvantage salmon eggs from Prince Edward Island in eastern Canada to Chiriquí province in western Panama. AquAdvantage salmon – AquaBounty’s lead product – was created by taking genetic material from Chinook salmon and a seal eel to modify an Atlantic salmon to enable it to grow twice as fast as conventional fish. The eggs exported from Canada will be allowed to hatch into fish in Panama but must ultimately be destroyed since the company does not yet have approval to sell AquAdvantage for human consumption. “We are pleased to note that, after a rigorous examination of our hatchery facility and the Standard Operating Procedures used to produce AAS eggs, Environment Canada is satisfied that we can responsibly produce our sterile, all female eggs on a commercial scale,” said Ron Stotish, the CEO of AquaBounty. The approval from Environment Canada could have a significant impact on a pending decision by the U.S. Food & Drug Administration, which is weighing the idea of allowing commercial sale of genetically modified salmon in supermarkets. Environment Canada’s decision is a little unusual given that AquaBounty has come under fire for failing to meet Panamanian environmental regulations. Last week AquaBounty was the subject of a complaint from the Environmental Advocacy Center of Panama to Panama’s National Environmental Authority after a 2012 investigation showed that the company had failed to submit regular monitoring or obtain permits for wastewater discharge. AquaBounty has been conducting research and running tests on genetically modified fish for some 20 years in the hope that it will eventually win approval to market its products in the estimated $100 billion global fish market. The company is also testing modifications of other fish like tilapia and trout. Sale of genetically modified fish faces significant opposition in the U.S. Some 36,000 people wrote to the FDA after the agency issued an opinion stating that it believed that AquAdvantage salmon would have no significant impact on the U.S. environment. 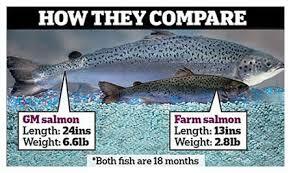 If the FDA allows the company allows AquaBounty to sell unlabeled AquAdvantage salmon alongside conventional fish, the company’s sales are likely to boom, given the history of other unlabeled genetically modified agricultural products from companies like Monsanto. Already a number of other U.S. markets have been overwhelmed by genetically modified crops mostly because they are cheaper to produce and consumers are typically unaware of their entry into the food chain. Today an estimated 85 percent of all processed foods in the U.S. contain altered crops – primarily corn and soy.